CKD is common and frequently complicated with hypertension both predialysis and in ESKD. As a major modifiable risk factor for cardiovascular disease in this high-risk population, treatment of hypertension in CKD is important. 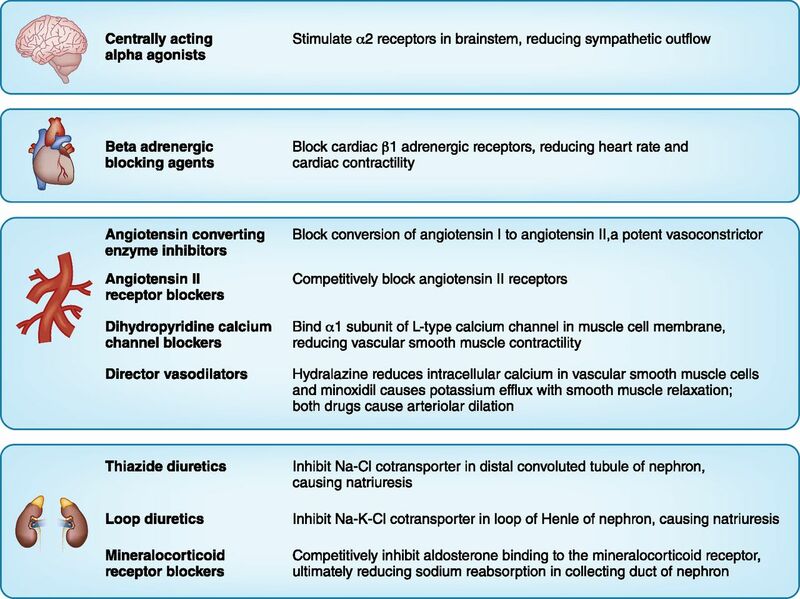 We review the mechanisms and indications for the major classes of antihypertensive drugs, including angiotensin-converting enzyme inhibitors, angiotensin II receptor blockers, β-adrenergic blocking agents, dihydropyridine calcium channel blockers, thiazide diuretics, loop diuretics, mineralocorticoid receptor blockers, direct vasodilators, and centrally acting α-agonists. Recent evidence suggests that β-adrenergic blocking agents may have a greater role in patients on dialysis and that thiazide diuretics may have a greater role in patients with advanced CKD. We conclude with sharing our general prescribing algorithm for both patients with predialysis CKD and patients with ESKD on dialysis. Treatment of hypertension plays a central role in the management of CKD, including in patients with ESKD. Hypertension is both a cause and a consequence of CKD, and its prevalence is high among patients with CKD and ESKD (1,2). Patients with CKD have an outsized burden of cardiovascular disease; indeed, the presence of CKD represents a coronary risk equivalent on par with diabetes mellitus (3). Additionally, the treatment of hypertension is associated with improved cardiovascular outcomes in both CKD (4) and ESKD (5). Thus, the management of hypertension in CKD and ESKD is both a common and an important issue for patients and practitioners. Nonpharmacologic treatment of hypertension includes dietary sodium restriction (6) and additionally for the dialysis population, vigilant maintenance of an adequate dry weight (7). Despite best efforts, nonpharmacologic methods alone are insufficient in controlling hypertension. In a large CKD cohort, 60% of the patients were being treated with three or more antihypertensive medications, suggesting that resistant hypertension is very common in this population (1). Given that the pharmacologic treatment of hypertension is an important consideration for the management of CKD, the objective of this review is to survey the clinical pharmacology of the major classes of antihypertensives from a nephrocentric point of view and provide practical insights when using them in patients with CKD and ESKD. Angiotensin-converting enzyme inhibitors (ACEis) and angiotensin II receptor blockers (ARBs) are the mainstays of hypertension treatment in CKD. ACEis block the conversion of angiotensin I to the potent vasoconstrictor peptide angiotensin II, whereas ARBs competitively block the angiotensin II receptors (8). This blockade has the effect of reducing aldosterone secretion and reducing peripheral vascular resistance, effectively reducing systemic BP. Importantly, the blockade of angiotensin II also results in dilation of the efferent arteriole of the glomerulus, which reduces intraglomerular pressure and is the putative mechanism for the renoprotective effects of these agents. The use of ACEis and ARBs is now well established for the treatment of proteinuric CKD (9). Heart failure with reduced ejection fraction and acute myocardial infarction (10), both of which commonly coexist with CKD, are other important reasons to treat patients with ACEis or ARBs. The panel members appointed to the Eighth Joint National Committee (JNC8) found moderately strong evidence to recommend initial or add-on treatment with ACEis or ARBs for hypertension in all patients with CKD to improve kidney outcomes (11). The recently published American Heart Association and American College of Cardiology (AHA/ACC) guidelines on hypertension similarly recommend ACEis or ARBs in CKD stage 3 or higher or those patients with albuminuria of at least 300 mg/d or 300 mg/g creatinine on spot check (12). The broad recommendation of the JNC8 to treat all patients with hypertensive and CKD compared with the more targeted recommendation of the AHA/ACC represents the uncertainty of benefit for ACEi or ARB use in patients with CKD without proteinuria, because the evidence is mixed. Notably, a large randomized, controlled trial of 1094 subjects found that ramipril use is beneficial to slow decline in GFR, although >65% of subjects in the trial had proteinuria <0.22 on spot ratio (13), whereas a meta-analysis of 11 randomized trials totaling 1860 subjects found no kidney benefit to ACEi use for those subjects with proteinuria <500 mg/d (14). The seeming dilemma is less fraught in practice, however, because patients commonly are not labeled as having CKD unless they have proteinuria or a serum creatinine high enough to merit a diagnosis of CKD stage 3, and furthermore, the majority of such patients with hypertension require multiple agents to achieve adequate control. Furthermore, as noted in the JNC8 recommendations, multiple agents are frequently required to control hypertension in CKD, and therefore, it is reasonable for an ACEi or ARB to be included. Dual use of ACEi and ARB medications is currently not recommend for treatment of hypertension largely on the basis of the results of the Veterans Affairs Nephropathy in Diabetes Trial in patients with diabetic nephropathy with or without hypertension (15). Subjects were randomized to losartan plus lisinopril versus losartan plus placebo for prevention of a primary composite end point of kidney events or death, and the trial was halted early for lack of efficacy as well as for increased adverse events of hyperkalemia and AKI in the dual therapy group. A Lancet meta-analysis notes that the dual renin-angiotensin-aldosterone system blockade may have some benefit (16), but this will require further studies. Similarly, the direct renin inhibitor aliskiren has antihypertensive efficacy, but its role is undefined: large randomized trials that added aliskiren to ACEi or ARB therapy in diabetes or heart failure found no cardiovascular or kidney benefit, but these trials did show more adverse events for the combinations, including hyperkalemia (17,18). Therefore, direct renin inhibitor drugs plus ACEi or ARB therapy are currently contraindicated. Although there is no evidence for aliskiren being superior to ACEi or ARB therapy to improve clinical end points, the direct renin inhibitor could be used as a substitute renin-angiotensin-aldosterone blocker in the select group of patients who are unable to tolerate ACEi or ARB for reasons other than hyperkalemia. In the ESKD population, ACEis and ARBs both are effective at lowering BP. Most ACEis are cleared by the kidneys, and it has been shown for both lisinopril (19) and trandolapril (20) that BP is effectively lowered when dosed only three times weekly after hemodialysis (HD), which presents the option of directly observed therapy for hypertension in HD units when medical adherence is a concern; however, because both drugs are dialyzable, the dose should be administered after dialysis. A meta-analysis of three randomized trials using ACEis or ARBs in HD (837 total subjects) found a significant reduction in left ventricular hypertrophy (LVH) but only a trend toward reduction in cardiovascular events (21). Because the renin-angiotensin-aldosterone system is directly responsible for distal nephron potassium excretion, all blockers of the system promote hyperkalemia, and this is unsurprisingly the common side effect of ACEi and ARB therapy (22,23). When the two classes of drugs are combined, this side effect is even more common. Furthermore, in those with higher baseline potassium and among those with CKD stage 3B or more, the incidence of hyperkalemia is even greater. β-Adrenergic blocking agents (BABAs) used to treat hypertension all block the β1-adrenergic receptors that are expressed primarily in cardiac tissue. Although some BABAs, such as carvedilol and nebivolol, have vasodilating effects, it is the β1-activity that characterizes the main effects of these medications, with resulting reductions in heart rate and cardiac contractility (8). Although the precise mechanism that leads to long-term reduction in systemic BP remains unclear, a reduction in systemic vascular resistance is thought to mediate the antihypertensive effect of BABAs (24). There is a large body of evidence showing the benefit of BABAs in the setting of heart failure with reduced ejection fraction (25) and after acute myocardial infarction (26), but despite these benefits, these agents are not recommended for initial monotherapy of hypertension in the general population (27,28). These recommendations from the general population may not apply to patients with CKD. This is because increased sympathetic activity is known to be a contributor to hypertension in CKD, which has been most dramatically shown in ESKD (29). Patients with CKD or ESKD are typically excluded from large trials, and therefore, head to head studies of antihypertensives in CKD or ESKD are few, but a recent randomized, controlled trial in HD comparing lisinopril with atenolol provides some useful observations. The Hypertension in Hemodialysis Patients Treated with Atenolol or Lisinopril (HDPAL) Trial randomized 200 patients on chronic HD with hypertension and LVH to lisinopril- or atenolol-based antihypertensive therapy for 1 year to determine which drug is superior for reduction of LVH (30). All subjects were treated to the same target monthly home BP by first maximizing the study drug and then addition of other drugs, sodium restriction, and reduction in dry weight. The trial was stopped early by an independent data safety monitoring board because of significantly more serious adverse cardiovascular events in the lisinopril group driven by heart failure hospitalizations. LVH improved similarly in both drug groups. The monthly home BP was consistently lower in the atenolol group, despite significantly more antihypertensive medications and nearly 3 kg more dry weight reduction in the lisinopril group (30). Thus, atenolol seems to be superior to lisinopril for BP reduction and possibly, reduction of cardiovascular event rates in this HD population. Additional trials are necessary to confirm the potential superiority of BABAs for reducing cardiovascular events before a broad recommendation can be made. However, in the absence of other head to head trials and on the basis of the results of this single trial, we now routinely start BABAs as the first-line pharmacologic agent for hypertension in our patients on HD. Atenolol, in particular, may be practically useful, because it too can be dosed just three times per week after HD to reduce 44-hour interdialytic ambulatory BP (31), which provides another drug that may be used as directly observed therapy for hypertension in this population. As with lisinopril, atenolol is also effectively removed by HD and thus, should be dosed after HD. Because the burden of cardiovascular disease in the predialysis CKD population is high, β-blocker use is common in this population. However, lacking any definitive studies to guide β-blocker prescription in CKD, we do not prescribe these medications as first-line agents for hypertension in this population. However, the surprising findings in the HDPAL Trial raise the question of whether β-blockers may be especially efficacious for managing hypertension and its complications in predialysis CKD, and further study is, therefore, warranted. BABAs have a host of well described side effects, but bradycardia is the most common concern among patients with CKD and ESKD. Most BABAs are cleared by hepatic metabolism; however, atenolol has only limited hepatic clearance, and drug levels are dependent on kidney elimination, making acute deterioration in kidney function a risk for significant bradycardia. Surprisingly, however, a large retrospective cohort study found that, compared with those on metoprolol, patients prescribed atenolol had reduced mortality and no increased risk of hospitalization for bradycardia or hypotension (32). In our practice, we avoid prescribing selective α-adrenergic blocking agents, such as doxazosin, for the treatment of hypertension in patients on HD. This is because we have noticed the frequent occurrence of orthostatic hypotension after dialysis, especially among patients who are close to their dry weight. On occasion, these orthostatic symptoms become troubling and have resulted in falls and fractures. Furthermore, although unrelated to CKD, it should be noted that, in the Antihypertensive and Lipid-Lowering Treatment to Prevent Heart Attack Trial, the α-blocker arm was terminated early due to excess heart failure hospitalization. Calcium channel blockers bind to the α1-subunit of the L-type calcium channel in muscle cell membranes, reducing calcium flux through the channels and lowering cytosolic calcium concentration, which ultimately reduces muscle contractility (8). The dihydropyridine calcium channel blockers (DHP-CCBs) are so called for their shared chemical structure, and they are more specific for vascular smooth muscle, causing arterial vasodilation with fewer effects on cardiac muscle than the non–DHP-CCBs verapamil and diltiazem. Although non–DHP-CCBs can reduce BP, they are not commonly prescribed in our practice primarily because of many drug interactions, notably with statins and calcineurin inhibitors. Furthermore, non–DHP-CCBs, when combined with BABAs, can provoke atrioventricular conduction delays and complete heart block. The DHP-CCBs are effective and well tolerated, which is why they are recommended first-line therapy in some guidelines for uncomplicated primary hypertension (33). Large trials specifically examining DHP-CCBs for hypertension in CKD are lacking, but these drugs have been used to lower BP as an active comparator in landmark trials of ACEi (13) and ARB (23) agents in CKD. They are effective antihypertensive agents in both CKD and ESKD (34). A major advantage of using DHP-CCBs is that they work well in a volume-expanded state. Furthermore, when used with ACEis or ARBs, they lower BP more than either drug alone. The DHP-CCBs are highly protein bound and cleared almost exclusively by hepatic metabolism; therefore, their dosing is not affected by kidney dysfunction. The common side effect for these medications is peripheral edema, which improves with cessation of the drug but may also be treated with concomitant diuretic therapy or ultrafiltration on dialysis. In our approach to prescribing medications for the treatment of hypertension among patients on HD, we use a long-acting DHP-CCB, such as amlodipine or felodipine, as second-line therapy (35). In patients with predialysis CKD, we often prescribe a dihydropyridine as second line to an ACEi or ARB on the basis of their synergistic ability to reduce BP. In patients with contraindications to ACEis or ARBs or cardiac conduction defects, we sometimes use these drugs as first-line agents. Thiazide diuretics are the oldest class of antihypertensive drugs still in use. Thiazides improve cardiovascular outcomes, including stroke, heart failure, coronary events, and death (36,37). The site of action for thiazides is the Na-Cl cotransporter in the distal convoluted tubule of the nephron, which is responsible for around 5% of total sodium reabsorption (8). The first such drugs entered into clinical use in the 1950s and were all derived from benzothiadiazine, leading to the name of the class. Newer diuretics, such as metolazone and chlorthalidone, do not share the same chemical structure, but they share the same pharmacologic mechanism of action and thus, are formerly referred to as thiazide-like diuretics; however, in common practice, all diuretics that act on the Na-Cl cotransporter are called thiazides (Figure 1, Tables 1 and 2). Thiazide diuretics reduce BP acutely by causing natriuresis, thereby reducing extracellular volume, venous return, and ultimately, cardiac output. However, in the setting of chronic thiazide administration, cardiac output has been shown to return to the pretreatment baseline and total peripheral resistance falls, maintaining the net antihypertensive effect (38,39) The mechanism that causes the fall in total peripheral resistance is unknown but may be related to a slight reduction in volume. In the setting of chronic volume expansion, such as ESKD, an increased cardiac output culminates in increased peripheral resistance and hypertension (40). Notably, natriuresis seems to be essential for BP reduction, because a very high-salt diet at 20 g of NaCl daily for 2 weeks has been shown to reverse the antihypertensive effect of chronic chlorothiazide use (41). On the basis of very small early studies that predated development and clinical use of loop diuretics, the prevailing dogma has been that thiazides are ineffective at low levels of GFR. Guidelines recommend switching from thiazides to loop diuretics when GFR falls below 30 ml/min per 1.73 m2 (42). However, the evidence against thiazide use in advanced CKD is weak. The JNC8 and the AHA/ACC recommendations take no position on the use of thiazides versus loop diuretics in CKD (11,12). The Kidney Disease Improving Global Outcomes guidelines are less dogmatic than before, acknowledging that, although many clinicians switch from thiazides to loop diuretics, the antihypertensive benefit of thiazides may still be preserved at low levels of GFR (43). In fact, there are ≥14 studies, including five randomized, controlled trials, of thiazides either alone or in combination with a loop diuretic in advanced CKD, and all show some degree of efficacy, whether for hypertension or diuresis (44). Whereas all of these prior studies were small, currently there is an ongoing double-blind, randomized, controlled trial of chlorthalidone in CKD stage 4 for hypertension with a goal of randomizing 160 subjects (45). As with loop diuretics, higher thiazide doses are necessary to achieve a therapeutic effect in the setting of CKD, because these drugs act on the luminal side of the tubular epithelium, and with reduced tubular mass in CKD, less drug is secreted into the tubular lumen (46). Glucose intolerance and electrolytes abnormalities, including hypokalemia, hyponatremia, and hyperuricemia, are all recognized complications of thiazide therapy and require regular laboratory monitoring when these drugs are used. There is no role for thiazide diuretics in ESKD, because they are ineffective, and volume removal can be achieved with ultrafiltration on dialysis. Furthermore and unsurprisingly, the placebo controlled administration of hydrochlorothiazide 50 mg daily or metolazone 5 mg daily to patients who are anuric on dialysis for 4 weeks showed no improvement in BP (47). Loop diuretics are so called because their mechanism of action is to inhibit the Na-K-2Cl cotransporter in the apical membrane of kidney tubular epithelial cells located in the thick ascending limb of the loop of Henle, which is responsible for around 25% of sodium reabsorption under normal conditions (8). As a class, loop diuretics are relatively short acting, which has limited their widespread adoption to treat chronic hypertension compared with readily available thiazide diuretics (48). Famously, the trade name for furosemide is Lasix, so called because it lasts only 6 hours. However, as noted above, the tradition has been to change diuretic therapy from thiazides to loop diuretics when GFR declines below 30 ml/min per 1.73 m2. As with thiazide diuretics, higher doses of loop diuretics will be necessary to achieve a therapeutic effect in CKD (46). Notably, the antihypertensive and diuretic effects of loop and thiazide diuretics are additive (44), which can be vital in the setting of refractory volume overload seen in advanced CKD, congestive heart failure, or end stage liver disease. Similar to thiazide diuretics, volume depletion and electrolyte abnormalities, including hypokalemia, are common complications of loop diuretic therapy, and regular monitoring is, therefore, required. In the case of ESKD, systematic evidence is lacking, but in practice, loop diuretics are often not discontinued when patients first start dialysis to help address volume overload. As with thiazides, loop diuretics too have been tried in patients who are anuric on dialysis, but doses of furosemide as high as 250 mg intravenously are ineffective (49). Thus, the role for the use of loop diuretics in ESKD is marginal at best, being limited to only those patients with significant residual kidney function. In an effort to minimize polypharmacy in our patients on dialysis, it has been our practice to discontinue diuretics in our patients when they initiate kidney replacement therapy. Under normal conditions, aldosterone enters the kidney collecting duct cells via the basolateral membrane and binds with the mineralocorticoid receptor in the cytosol before translocating to the nucleus, where the aldosterone receptor complex regulates gene expression, including a cascade of steps that prevent the turnover and degradation of epithelial sodium channels on the apical side of the collecting duct cell (8). Mineralocorticoid receptor blockers (MRBs) competitively inhibit aldosterone binding to the mineralocorticoid receptor, which ultimately increases epithelial sodium channel degradation and thus, results in reduced sodium reabsorption at the expense of reduced potassium excretion. The available mineralocorticoid receptor antagonists spironolactone and eplerenone have well established roles in the general population with heart failure (50,51) and recognized efficacy for treating resistant hypertension (52). In the setting of CKD, there is also growing interest in using spironolactone to reduce proteinuria as shown in a recent meta-analysis that included studies of MRBs added to ACEis or ARBs in the setting of CKD; it found that MRB use was associated with both reduced BP by 6 mm Hg systolic and proteinuria reduced by 40% (53). Hard cardiovascular or kidney end points could not be assessed by the meta-analysis, but the findings are encouraging, and we await appropriately designed randomized trials to explore this promise further. Both spironolactone and eplerenone are hepatically metabolized. In the case of the eplerenone, the metabolites are inactive, but with spironolactone, many metabolites are active and excreted by the kidney; thus, extra caution must be taken in the setting of CKD. As with ACEis and ARBs, hyperkalemia is the major limiting side effect, precluding the widespread use of MRBs. In our clinical practice, we have adopted an aggressive approach to prescribing MRBs in CKD, especially in patients who are hypokalemic because of ongoing therapy with thiazide or loop diuretics. In ESKD, spironolactone has been shown to significantly improve 24-hour ambulatory BP (54), but most impressively, two randomized, controlled trials of spironolactone on dialysis have shown reduced cardiovascular mortality (55,56). Notably, hyperkalemia was only a rare complication in these trials of patients on dialysis. It is likely that the salutary effects of spironolactone are due to mechanisms other than alteration of kidney sodium and potassium handling, because an explicit inclusion criterion for one trial was for oliguria. Therefore, the beneficial effects of spironolactone are plausibly due to a direct cardiac or vascular mechanism. Several follow-up studies are ongoing, and results must be analyzed before widespread use of MRBs in dialysis can be recommended; however, we have been more liberal in prescribing spironolactone to our patients who are hypertensive with ESKD who only rarely miss HD. The oral direct vasodilators are hydralazine and minoxidil. Hydralazine’s precise mechanism is unclear, but it culminates in a fall in intracellular calcium in vascular smooth muscle cells (8). Minoxidil is hepatically metabolized to its active metabolite, which inhibits the ATP-modulated potassium channels of vascular smooth muscle, leading to potassium efflux and smooth muscle relaxation (8). Hydralazine and minoxidil are similar in that both cause arteriolar dilation without venous dilation and both cause reflex tachycardia and volume retention with edema, which can manifest as pericardial effusion in extreme cases. Minoxidil uniquely also reliably causes hirsutism in a dose-dependent fashion. Hydralazine is rapidly metabolized by the liver to inactive metabolites, whereas minoxidil is also primarily hepatically metabolized; however, roughly 20% is excreted in the urine as unchanged drug, which may explain why it can be effective when dosed only once daily in CKD. Both vasodilator agents can lower BP in CKD or ESKD, but they are typically reserved as last-line therapy for hypertension due to lack of proven efficacy for reducing clinically relevant outcomes. The exception is that hydralazine is being used more often on the basis of results of the African American Heart Failure Trial that showed evidence of mortality benefit in combination with isosorbide dinitrate (57), but it is important to recognize that subjects with significant kidney disease were excluded from the trial and that the combination of medications has not been studied specifically in CKD or ESKD. Furthermore, the pill burden and requirement of three to four times daily dosing of hydralazine make its use less attractive. It is for that reason that we recommend minoxidil over hydralazine on account of its long duration of action, providing antihypertensive effectiveness with only once daily dosing in the setting of CKD. The centrally acting α-agonists clonidine and guanfacine are so called because their mechanism of action is to stimulate α2-receptors in the brainstem, reducing sympathetic outflow (8). Both medications frequently cause dry mouth, sedation, and bradycardia, and both drugs exhibit rebound hypertension when stopped abruptly. Both medications are 50% excreted as unchanged drug in the urine, which therefore, requires greater vigilance for side effects when used in patients with CKD. Although this class of medication can treat hypertension in both CKD and ESKD, on account of their side effects, they are typically reserved only for those patients whose BP is uncontrolled on numerous other medications. To minimize pill burden and dosing schedule, we prefer to avoid oral clonidine and instead use the long-acting clonidine patch, which can be administered once a week at the dialysis unit as directly observed therapy. Because the clonidine patch can be expensive, a cheaper alternative is oral guanfacine, which is longer acting and thus, can be dosed only once daily at bedtime to minimize the dose-related drowsiness. In the setting of predialysis CKD and in the absence of specific indications for other drugs, our practice is to prescribe an ACEi or ARB as first-line therapy for hypertension in accordance with the recent AHA/ACA recommendations for patients with CKD stage 3 or greater or those with albuminuria of at least 300 mg/d or 300 mg/g creatinine on spot check, which describes the vast majority of patients who we see (12). In our hands, second-line therapy is between a DHP-CCB or a diuretic, with the latter chosen if the patient has signs of volume overload or if we judge that an MRB will be urgently necessary to manage uncontrolled proteinuria and wish to lower potassium before starting the MRB. When using diuretics, we typically choose chlorthalidone or torsemide due to their long durations of action. We prefer chlorthalidone over hydrochlorothiazide because of its longer duration of action and greater potency. We prefer chlorthalidone over metolazone because of its lower cost. Our choice for third-line therapy completes the triad of ACEi or ARB, DHP-CCB, and diuretic. Those patients with uncontrolled hypertension despite adequate doses of those three agents have resistant hypertension by definition, and we routinely prescribe spironolactone as a fourth agent in this scenario on the strength of the PATHWAY-2 Trial (52), which showed efficacy for spironolactone to reduce home BP in subjects with resistant hypertension despite ACEi, DHP-CCB, and thiazide diuretic use. Importantly, this is an extrapolation to the CKD population, because the PATHWAY-2 Trial excluded subjects with CKD stage 3B or worse, and the average eGFR was 91 ml/min per 1.73 m2 for trial subjects. Notably, with the availability of new oral potassium exchange compounds patiromer and potentially, zirconium cyclosilicate, there is renewed interest in using these drugs to prevent hyperkalemia and permit prescription of ACEi, ARB, and MRB drugs in the setting of CKD. In contrast, we are of the opinion that aggressive use of inexpensive thiazide-like and loop diuretics alone or in combination can often control and prevent hyperkalemia and may preclude the need of more expensive, newer potassium exchange drugs. We acknowledge that definitive trials comparing the two approaches are lacking. When resorting to pharmacotherapy for hypertension on HD, in the absence of specific indications for other drugs, we prescribe atenolol as first-line therapy on the basis of the results of the HDPAL Trial (30). For second-line therapy, we use dihydropyridines. We use ACEis or ARBs as our third-line choice. Although the early studies suggesting that MRBs reduce cardiovascular mortality in ESKD are promising (55,56), because of the risk of hyperkalemia, we do not prescribe MRBs routinely and await larger and more definitive studies. A.D.S. had consulted for Janssen and received research funding from Bayer. R.A. has consulted for the following companies: Akebia; Astra Zeneca; Bayer; Boehringer Ingelheim; Celgene; Daiichi Sankyo, Inc.; Eli Lilly; Glaxo Smith Kline; Ironwood Pharmaceuticals; Janssen; Reata; Relypsa; Sanofi and Genzyme US Companies; Takeda Pharmaceuticals, USA; and ZS Pharma.